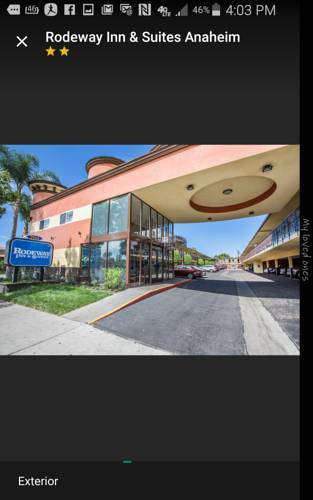 When traveling on a budget, enjoy a simple stay at the Rodeway Inn and Suites near Convention Center hotel in Anaheim, CA. We are within walking distance of the Anaheim Convention Center and give our valued guests easy access to UC-Irvine, Angel Stadium and Honda Center. Amenities include free WiFi, free parking and free continental breakfast. Guest rooms feature a refrigerator, microwave, coffee maker, hair dryer and HDTV. Also, earn rewards including free nights and gift cards with our Choice Privileges Rewards program. Verify address-there are multiple Rodeway Inns in area. USD100 refundable deposit required of cash-paying guests. CC charged 24 hours prior to arrival-if declined, res. cancelled. 1 parking spot/room. - Long Beach Municipal Arpt.